4 How to Safely Jack Up! 5 When do We Use Floor Jacks? If you really want to be considered a do it yourself type person there are a lot of must-have tools that you need to store in your garage. Of course, there will be the normal tools such as wrenches, pliers, hammers, and screwdrivers but that hardly covers your needs to take on big projects. So you better own some power tools, a wet/dry vacuum and at least a saw or two. One of the most overlooked tools for any do it yourself type person that is a must is a sturdy floor jack. These come in handy for a variety of uses. That is why we are here to help you find the best floor jack for your needs. Why is a floor jack an important part of your of the tool selection you own? 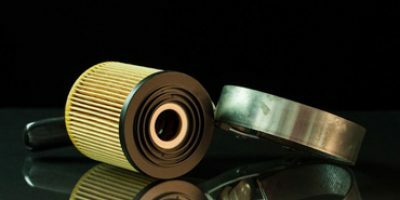 The obvious reason is to work on your car but there are many other uses than that too. It will provide a strong extra hand for heavy lifting, lift an edge of a bulky object to clean around it and can also be used as a pivot point for moving big objects ever so slightly. We hope reading the floor jack reviews will provide you with a clear answer and choice of which product is worth the value it states. This is a good quality floor jack that Arcan has designed here. It is a very low profile jack that makes jacking up a wide variety of objects very easy. This model floor jack is nearly indestructible because of its solid steel construction too. If you have used a low profile jack on a regular basis then you really want to consider this model floor jack. It is built extremely low to the ground so you can get under objects and vehicles that have very little clearance. This thing is built out of steel and it’s very sturdy but it is extremely hard for just one person to move. It is easily one of the heaviest jacks that we tested. Not an ideal jack for repeatedly lifting very heavy vehicles or objects. This was a pretty powerful floor jack that should be good enough to take care of any household or light commercial needs. Hein-Werner did a really nice job on the construction and design of this model floor jack. With its cast iron construction and solid u-joint, it is a really well-built jack, to say the least. We thought the swing length on the handle was a little shorter than we would have liked to see. You could not even get it close to the floor. The distance raised per pump was also short and it took a while to raise an object. This is a really nice high end all aluminum floor jack. You tend to get what you pay for here. It is very easy to move around and you can get it up to full height in just 5 or 6 quick pumps. What a really nice design here by OTC products on this two-ton floor jack. The best thing about this jack was how incredibly lightweight it is. It is made of mostly heavy duty aluminum construction. That is why it is easy to see how someone working for a race team that has to move a floor jack around would really like this model. It even came with two safety jack stands which is a big bonus. Sure it’s nice to have a floor jack that is made of mostly aluminum but that really drives up the cost too. This jack is not inexpensive by any means. We also had some concerns about the longevity of the hydraulic seals on this unit. This is an affordable and well-designed floor jack that Neiko has made. It will make small work of most household and light commercial lifting needs. It has a dual pump action to cut down on the number of strokes you need to raise a vehicle or other object. This is a really great price for an almost all aluminum floor jack. Usually, they are much higher priced than this. The low profile design also makes it easy to get under objects with very little clearance so you can lift them up. We did not like the position of the carrying handles on this floor jack. They were off center so the jack seemed off balance as you carry it. It’s a good jack but we were a little leery of lifting three tons with it too. This is a really powerful all aluminum floor jack built by JEGS. 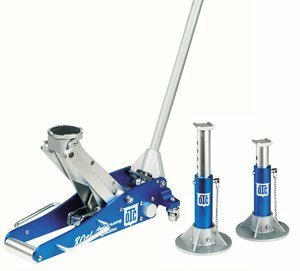 They are a company that is known for making quality products at affordable prices and this good floor jack is no exception. It works amazingly well for the price you pay for it. This is one of the lightest of all the jacks we tested. It as portable as you can get for a two-ton floor jack. It weighs just a little over 49 pounds which is incredible for how sturdy it is built. His thing is strong but it takes a while to lift an item. We also would not want to lift items at its high-end weight range with it on a regular basis because it does not seem as strong as some of the other all aluminum jacks we tested. This is one of the lesser known floor jack brands on our review list. It is an affordable jack but not extremely high quality. We think it will do nicely for light duty use around your home. This is one of the most powerful floor jacks we took a look at and we were really impressed with the lifting power it had. We can see it easily handling the full 3 ½ ton lifted capacity that this floor jack is rated for. We have to say that this is not an easy jack to move at all. It weighs in the 90-pound range and it’s like moving a horse. There were also some concerns we had with the quality of some of the parts on this jack; the casters on the bottom were one of the concerns. This is by far the most interesting design of any of the jacks that made our review list. It is one of the most stable floor jacks that we have ever tried. It is powerful but well-padded on its lift rails so you don’t have to worry about damaging what you lift with it. The square-shaped design of its lifting pad makes this jack really nice. If you center it right it really lifts objects very safely. It is a heavy duty floor jack to that should last you a while. If you do a lot of low clearance lifting with your floor jack then this is definitely not the model for you. It takes almost 6 inches of clearance to put it into place and start lifting. This floor jack is a bit to the heavy side also. Here is a very lightweight jack that is made by Torin. It’s hard to misplace it because of its bright red color and it can handle a variety of light duty lifting tasks. For one thing, you certainly cannot beat the price of this jack. It is not a super high-quality product but it will be fine for occasional home use by the weekend mechanic. 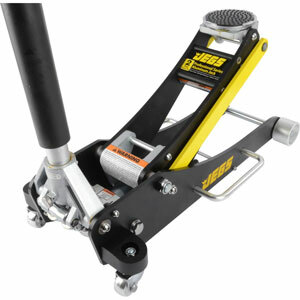 This floor jack has a nice positive locking release handle that makes this affordable floor jack very safe to use. This jack is ok if you only need to use one very occasionally. It is an entry level jack that we can see having some real durability issues if you try to do too much heavy lifting with it. There is an overload protection valve built into it which will help it last longer. This is an interesting floor jack because of its steel and aluminum construction. It can handle lifting objects up to three tons in weight. It is a floor jack that is affordably priced but built to last. Interesting construction on this floor jack; you might even call it a hybrid jack because you get the best of both worlds with it. You get the strength and durability of steel but also its weight is reduced because several of its parts are made of aluminum also. It’s priced really fairly for all you can do with it. This is a good floor jack but it seems like it takes forever to jack up heavier objects. Get ready to get some arm exercise with this model floor jack. 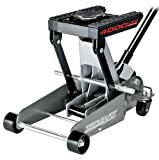 Blackhawk has made a high quality and sturdy floor jack with this model. It will lift an object up to around 19 inches (not the 22 inches the manual claims) and does not flex at all while doing so. Even the wheels on this model floor jack are solidly built. This jack may be hard to move around but it is built so solidly you can beat it up and it will still keep on working. We liked the solid steel frame construction of its parts very much. Here is another jack on our list that seems to take a lot of pumps to just get it up a little bit. We also see that this model floor jack should have been able to go up higher in level for how solidly it is built. As you can see buying a new floor jack is really a lot more complicated than most people would expect it to be. There are many things that you need to factor into your floor jack buying decision. Here are some of the things that you should concentrate on when you are searching for a new floor jack to buy. Price is a factor for most of us when it comes to buying an item such as a floor jack. These can run anywhere from less than $100 to over a thousand dollars. That is a pretty big price swing, to say the least. We find that quality and price do not correlate as much when it comes to the price of a floor jack. The biggest factors on the most expensive jacks seem to be superior operation and the fact they are made of lightweight materials. As a matter of fact, some of the best quality floor jacks are made out of steel and they are found in the lower range of floor jack pricing. You have to look at the type of jobs you want to do with the floor jack model you will buy in order to determine how powerful it must be. 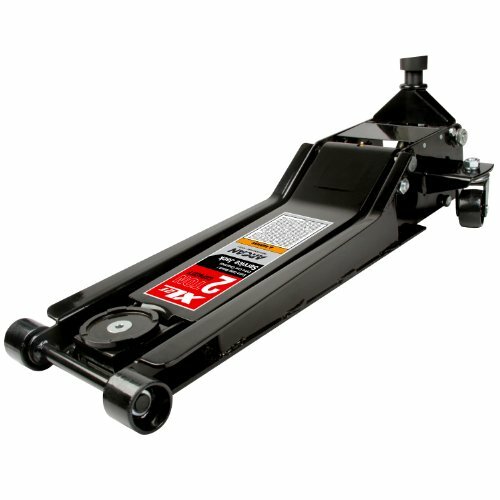 Most floor jacks are rated anywhere from 1 to 4 tons of lifting capacity. If you are just jacking up the family lawn mower on occasion with your jack then you don’t really need a super powerful jack. On the other hand, if you are jacking up your pickup truck with your new jack on a regular basis then you better get one that is powerful enough to handle the job easily. Jacks have to be built very sturdy in order for them to be able to handle the rigors of the job. That is why most heavy-duty floor jacks are made out of metal. The big differences here are the types of metal they are made out of. Aluminum is very popular these days because it is sturdy yet lightweight but it drives up the cost of a floor jack. Steelworks nice and is on the least expensive side but they are jacks that are usually heavy and hard to move. You will even see combination jacks that are built using both steel and aluminum. Weight may or may not be a big factor as far as your floor jack purchasing decision goes. 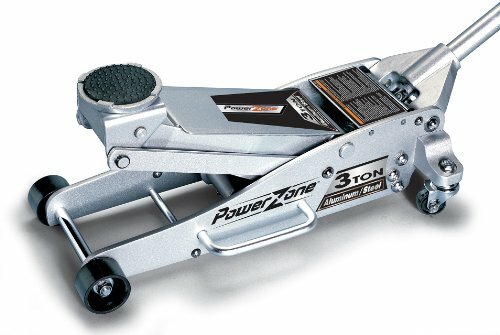 If you are buying the jack to change tires on a race car then you want an aluminum jack that is as light as possible. If your new jack is strictly for home use in your garage, then weight should not be a huge factor in your buying decision. So make sure you match the weight of any floor jack you will buy with your intended use. That way you won’t have a floor jack that does not work well for the tasks you will use it for. Cars that have a low clearance can be very difficult to jack up, to say the least. That is why you need a floor jack that is as low to the ground as possible. This is called a low profile jack. The lower the profile on a jack the better it is for working on such things as race cars and other performance cars that really hug the ground. A low profile jack may also be preferred if you are jacking up other things besides cars too. A-jacks profile height is determined by how far the jack’s saddle is off the ground at its lowest point. 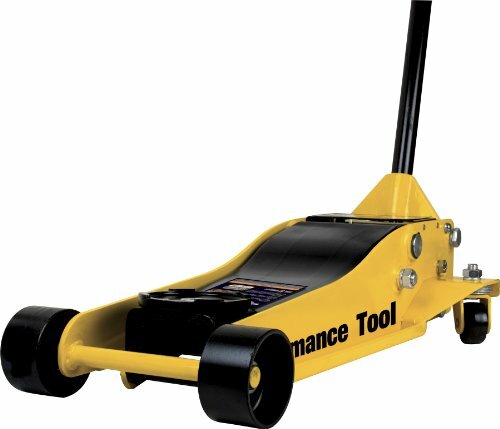 Just like there is a wide variety of lifting capacities in the world of floor jacks, so too is there a wide variety in the time it takes an individual jack to lift a vehicle. There are floor jacks that work rapidly and will lift a vehicle as high as possible in just a few pumps of the jack handle and there are also those floor jacks where it seems you pump and pump but they only rise up a little at a time. In situations such as a jack that is used during racing, you would want a jack that raises the car very quickly. So jacking speed can certainly be a factor for some people during the floor jack buying process. Chances are the floor jack model you will purchase will be working under some extreme conditions. You also never know when a jack will have some material failure or it was poorly put together at the factory. That is why you need a good warranty on any floor jack purchase that you make. So be aware of what the warranty is on any model floor jack you are thinking about purchasing. So when you are out there searching for the right floor jack for your needs. Keep these jack characteristics in mind when shopping so you can narrow done your choices and get a jack that is perfect for what you will be using it for. Here is some important and useful information on floor jacks and it applies to other types of jacks too. Just in case you were curious. The first-floor jacks that could safely lift up automobiles date all the way back to 1918. It was apparent right away after the automobile was invented that these were going to be a useful and very necessary piece of equipment. They could not have been more right. The company that invented this first jack was called Miller Falls Automobiles. As you can probably guess they were located in Miller Falls, Massachusetts. 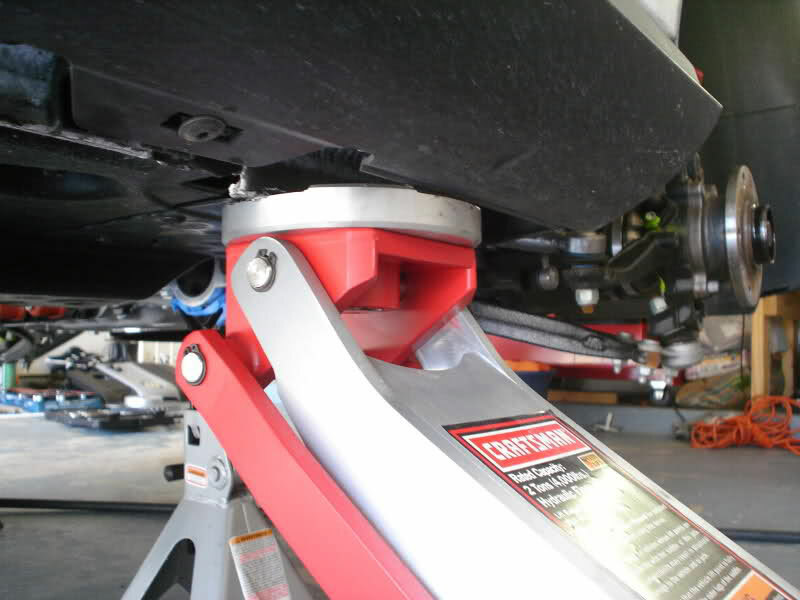 Hydraulic lift jacks are something that you see every day when you go to a muffler shop or auto repair center. They make it very easy to lift up even the biggest trucks if they are large enough. Most mechanics could not imagine working under a vehicle if they did not have the ability to jack it up. Unfortunately, these types of huge hydraulic jacks are not practical for people to put in their homes because they take up too much room and are very expensive. So that leaves the job of jacking up your car at home to another type of jack. Here are the three main types of car jacks that you will see people use to work on their vehicles at their home. These are hand operated jacks that use no hydraulics for lifting. Scissor jacks are also the easiest of the jacks that we will discuss to store. That is why many cars include them to help change out a flat tire with a spare. For being a 100% mechanical jack they can easily lift a vehicle. The process is slow but it gets it done efficiently. 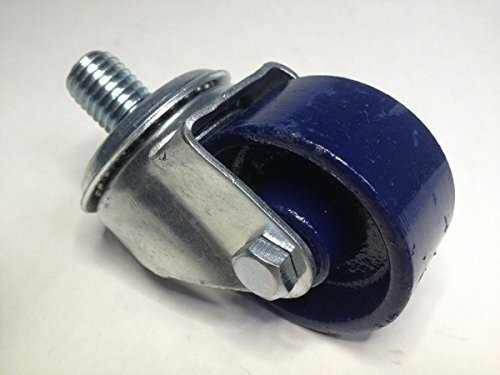 Be very careful when using these because they do not have a big base on them to keep them sturdy when jacking up your car. These jacks are very compact and very heavy. Despite their diminutive size, they can really lift a very large amount of weight. They are a very powerful jack that uses simple hydraulics in order to raise up a vehicle. The hydraulics is activated by placing your tire iron in a plunger in the cylinder and then pumping it up and down. They take much less energy to lift a vehicle than a scissor jack. They are not only more powerful than scissors jacks they cost more too. These jacks are powerful hydraulic jacks that are easy to use for the most part. The bad thing about them is that they are heavy, bulky and not very portable because of that. But they work great in a home garage and most of them can easily lift up a vehicle to do something like a tire change. They can be rated as high as being able to lift four tons. 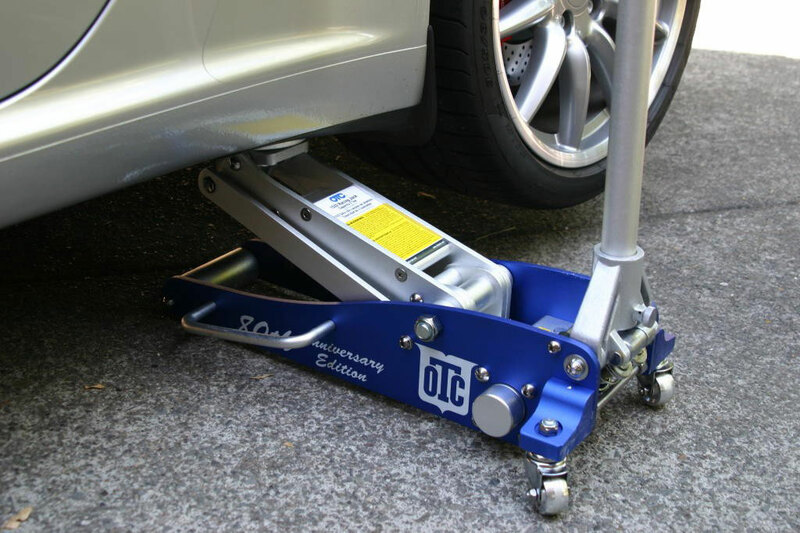 They provide a sturdy base when jacking up a car because they are wider and longer than the other two types of jacks. These can be very costly in price for the best ones. You would be hard-pressed to find a vehicle that did not have one of these in it. 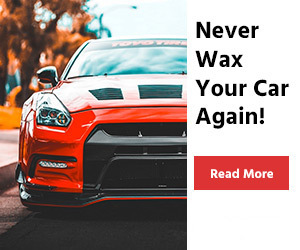 They are usually paired with a scissors jack and a spare tire when you buy a new car. They not only help loosen the lug nuts on a vehicle but they are also an integral part of working the jack. The ones that come with a vehicle are not that great so many times it is advisable to buy a better one at an auto parts store and carry that with you too. These are absolutely invaluable when it comes to jacking up your vehicle. We feel that you never crawl under a vehicle that has just been jacked up unless you have added jack stands strategically placed underneath it for safety reasons. These do not pump up and down like a jack; they have holes in them and a solid metal key to push through the holes to lock them into place. These are devices that are designed to keep a car that is being jacked up from rolling off the jack as you work it. Many people keep wheel chocks in their vehicle for other reasons than just when they are jacking up their car or truck too. 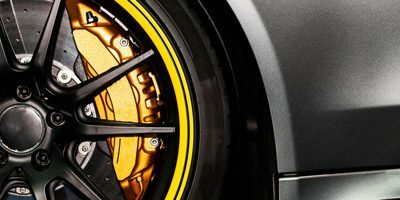 They are used in combination with a vehicle’s parking brake to keep a car from rolling under certain conditions. They are usually made of either sturdy wood or solid rubber. How to Safely Jack Up! Floor jacks and other types of jacks, in general, are something that you need to pay close attention to when using. Mistakes that are made when jacking an object up can result in severe injury or even death. So you always have to think the job over before starting it and stay on your toes when you are using any type of jack. Look over the vehicle or object you are trying to jack up and get a game plan for how you will do it before starting as we mentioned. Make sure you have everything you need to do the jacking job close by because you don’t want to have to go far from the object you are trying to jack up during the process. It is especially important to have several jack stands standing by for safety. YOU NEVER WANT TO RELY on a floor jack to hold up a vehicle or other heavy object when working on it. NEVER ATTEMPT TO GO UNDER A VEHICLE until you have your jack stands properly placed and locked in. We cannot emphasize these last two points strongly enough. If you do not remember anything else we suggest to you in this article make sure you remember these two very important safety points. Before you start jacking up a vehicle or object you must find a sturdy place to locate your jack platform underneath. Failure to do this can have some severe consequences and result in serious injury or death. You never want to try jacking a vehicle or steel object up in a spot where it is showing rust or other signs of metal fatigue. 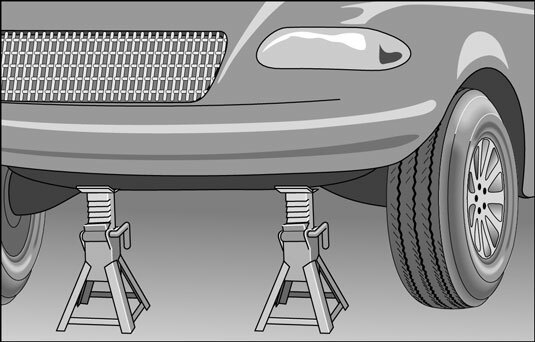 If you are jacking up a car you should always try to place your jack platform under a sturdy piece of the auto’s framework. Never use blocks to get additional lifting height unless they are very solid and thick pieces of wood. I have seen people use such things as bricks and cinder blocks to get additional jacking height and that is very dangerous to do. These types of materials can crush and break apart and that can create a very dangerous situation as you are lifting up an object. Once all these steps have been done you can then start jacking up your car or whatever heavy object you need to lift. You want to lift very slowly and pump the jack handle with very smooth and even strokes. Once you have the object lifted and the jack stands secured underneath it, next push on the object to make sure that it will not wiggle much when you push on it. If your car or the object being jacked up moves a lot after it has been secured on the jack stands then don’t attempt to go underneath your car or the object. There is absolutely no room for shortcuts when it comes to safely jacking up an object with a floor jack or any other type of jack. When do We Use Floor Jacks? If you love your car and love fixing its problems on your own, then you probably have this gadget in your garage. If you don’t, then do not wait any longer and get one. 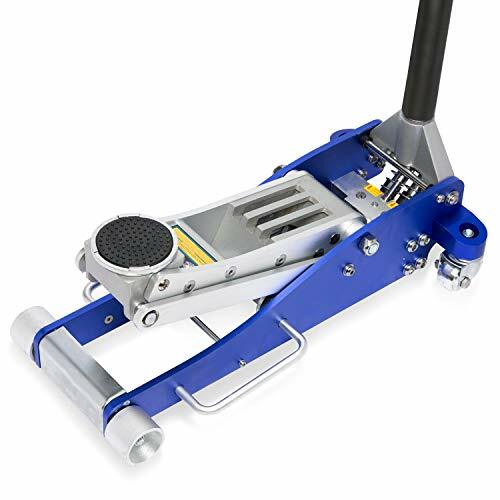 Floor jacks, also known as service jacks or trolley jacks, are mostly used for getting the flat tire off and replacing it with another, new one. However, there is a number of other things that you would normally do with a lot of effort but with a floor jack, they are a lot easier. If you want to change your oil, for example, you can use your floor jack to have access to the oil drain plug. Let’s say you want to remove the wheels throughout the course of tire rotation, you can easily lift the car and do your job. Floor jack can also be used during the change of brake pads. They will be of great use if you want to work on the transmission. As you can see there are so many different activities that you could try to do if you have a floor jack. Just remember, though, that depending on the design and material every floor jack has its own lifting capacity. Compared to the mechanical jacks they are the better choice and it doesn’t matter if you are an amateur or a mechanic. They need to be used only on hard, flat surfaces but their usage and transfer are so easy for they are equipped with either casters or wheels. You just have to have one if you want the work with your vehicle to be easier and effective. 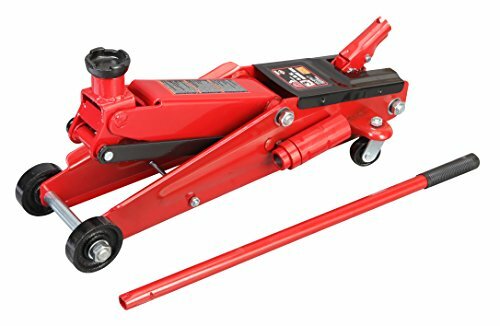 Yes, a floor jack is probably too big to be carried in the trunk of your car but you should most definitely have one at your disposal in your car workshop or your garage. 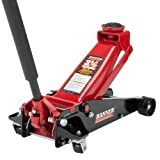 Are there any other tasks for which I could use a floor jack? – Yes, changing your flat tire is just one of the things you could do with this tool. Are there other types of jacks? – Yes, there are a couple. You should look them trough and decide what is it that you need. Do I need to be a professional mechanic to use a floor jack? – No, you just have to follow the instructions of the manufacturer and you’ll be fine. Can I carry a floor jack in the trunk of my car? – No, not really. It is too heavy but it is perfect for your garage. Floor jacks are not for roadside use. Should I read the review of the floor jack I am buying? – Of course, you should. You always have to know what exactly it is that you are buying. Do I really need the car owner’s manual? – Yes, do not throw it away! There always could be a situation in which you will need it. Am I safe under the car if I am only using a floor jack? – No, and it is a huge mistake thinking so. 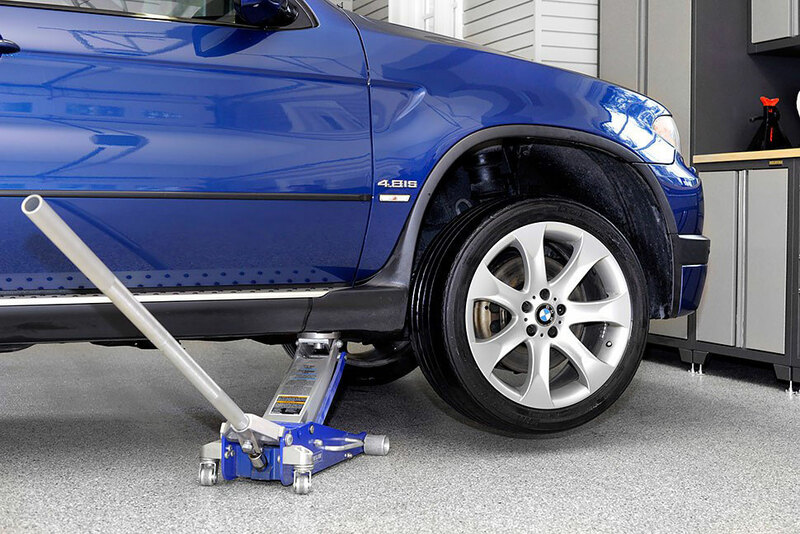 A floor jack’s main job is lifting the car up to a specific height. The jock stands, on the other hand, are designed precisely for keeping that car lifted. Must the lifting capacity of the floor jack be 100% the same as the weight of my car? – Yes, and this is actually crucial! It will even be better if it is suitable for a larger weight than your car’s. Is the lifting point of the car of such importance? – Yes! If you have chosen an area of the car that is not designed to withstand such weight as the car’s you may actually damage your vehicle. Hopefully, you have found the information on this floor jack reviews useful and you are a lot more informed as to what types of floor jacks are available in the marketplace. You will need to be well informed in order to find the best floor jack for your needs. Take your time shopping and make sure to look both in stores and online. There are lots of good deals to be had on floor jacks if you check many sources. If you know someone who has a good floor jack ask them what they paid and what they do and don’t like about it. Remember also you can never go wrong purchasing any of the good model floor jacks that we reviewed here. There is a wide variety of quality and price to choose from. Everyone should be able to find one that fits their budget and their needs. A floor jack is a very handy piece of equipment to have around and most people use them much more often than they ever imagined they would.